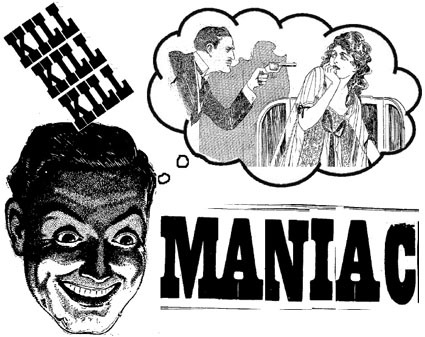 Our dear country, the United States of America, is being overrun by maniacal killers. Hardly a month goes by but an original killer followed by several copycats strikes, with the hideousness of their deeds sending our collective shock level to an all time high. Gone, apparently, are the days when people knew better. Seriously, I remember a time when maniacs sat in rocking chairs rocking back and forth, intellectually unable to even say the word gun; they weren't imagining a massacre. And if he felt like committing suicide, he just did it -- he didn't take anyone with him. Those were the days. They'd find another guy hanging in the barn and that was it. More or less, of course, you can't help it if you're a maniac. But the current breed of maniac seems to be in an entirely different class. In addition to being a maniac, they're very cold and calculating, able to assemble an arsenal as big as Fort Knox and keep it all on the sly, so that no one even has the slightest clue that they've turned their lonely apartment into an armed compound. Things have obviously changed when it comes to knowing our neighbors. We need more nosy neighbors, like on "Bewitched." But not having that, we need to do something else. My suggestion is that we do anything that works, measured of course by a significant time passing in which no one pulls anything terrible. I remember when I was a kid, somebody kept an eye on you. We were all pretty much normal -- I feel I was a normal kid, although, arguably a true maniac doesn't know he is one; to him everyone else is crazy. I, however, have looked at the issue of my own sanity "from both sides now" (Judy Collins), so I know, having that added level of perspective, that I am certifiably sane. I've seen my profile in the Akashic records. If you don't steal and you don't kill. You'll be a happy little fellow, yes you will. There was no second verse. You just repeated it forever, that one verse, making it easy enough to remember. Just one verse, but look at the values packed in there. Happiness, a guarantee of happiness. An if statement, happiness coming by refraining from stealing and killing. An alternative consequence, going to prison or jail, which, thank goodness, I was able to avoid. Of course, most of our maniacs these days end up killing from one to three hundred other people before they kill themselves, so they're not worried about jail or prison. What the answer to that is, I'm not entirely sure. It might call for a second verse, to address the changed conditions. Or very very severe gun control, getting guns out of the hands of everyone. They say "law-abiding" citizens should be able to have a big arsenal, which is fine till they decide (usually without letting us know) to suddenly become criminals. A guy I know said the maniacs could do the same dastardly killing with a pocket knife. To which I say, you can barely clean a fish with a pocket knife! You idiot.